I'll be the first to admit I've been a bit of a lacklustre blogger lately. Apologies to my readers and fellow bloggers if I haven't been as entertaining or been able to keep up with reply comments. Simply put, I am burned out. Work has kicked into overdrive with one deadline after another, I still have a Vancouver Fashion eZine assignment to finish, and in between dance and yoga classes, fashion events, trying to keep up with my resolution of cooking once a week, ongoing blogging, and time with the boy, I'm pretty exhausted. Life has become a neverending to-do list with one task demanding my attention when another one ends, and I'm dying for a vacation away from everything. The day before Canada Day, I had one of those work days where every email arriving in my inbox felt like a letter bomb. I pleaded with the boy for a date night out, so we had some Thai food and saw Toy Story 3 in 3D (very entertaining with a delightful Totoro cameo...highly recommend it). On Canada Day, we strolled around downtown, watched a live band play Michael Jackson and James Brown on Robson Street, picked up the navy blue Keds I ordered, and went back to his place to watch the classic Sergio Leone western A Fistful of Dollars. Oh, and I splurged on a red Ferragamo wallet. I'll do another "what's in my bag" post someday and show it to you along with the other contents of my bag, I promise...what I'm toting around now has changed since the last time I posted. My "sorta" weekend turned into the perfect staycation to keep stress at bay. To my Canadian readers, how did you spend Canada Day? To all of my readers, what are your plans this weekend? I relaxed today as I'm going through a 'burnout' phase to... but from being on my 6th straight semester of school. Hopefully all of your stuff levels out. Atleast you've still got some time for yoga and dance! I'm in these kind of "stress" lately too, but for me it's cool. I prefer to have things full time.. I'm an active person!.. Don't worry - you are not alone. I have been struggling to get back into the blogging word. Gg has been pushing me to blog because he knows how much I miss it but I am just so tired lately. Anyway, you look so cute!!! I can even see you wearing it as a dress for the summer! Don't be so hard on yourself Lisa. You can always take a day or two off blogging. Sounds like your schedule is pretty packed! How about posting some of your cute salsa dancing outfits? Yeah, like Anya said, no harm in taking a break because we all know how exhausting maintaining a blog can be! Your bangs look cute in these pics! 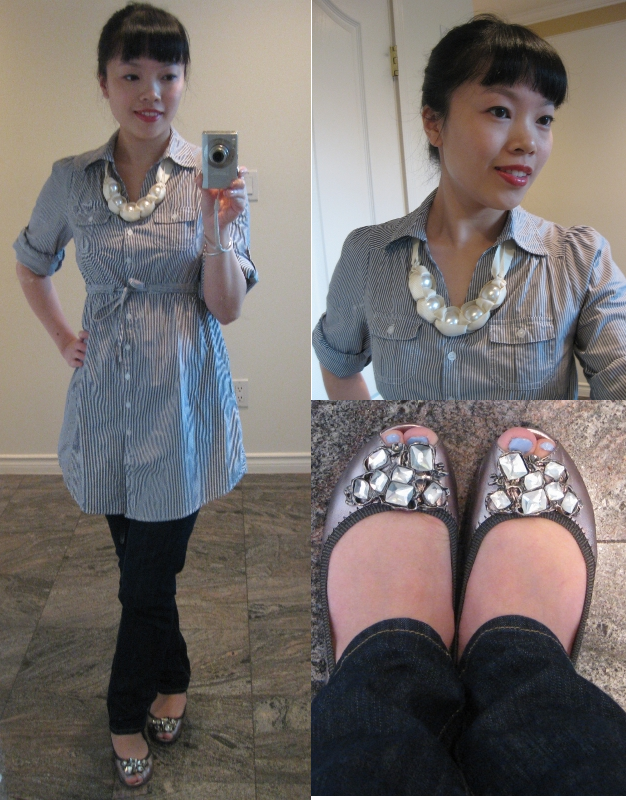 love the shirt dress and the jeweled shoes too. have a great weekend! You are so stinkin' cute! Love the outfit and the flats. i totallyyyyyy understand! life has been so crazy busy lately! i'm glad you've still made time to blog :) hope you get your vacay! good for you for taking some time out. i've been feeling the same lately - hence the lack of blog posts. i'm thinking of going to TS3 too w/ my niece so glad you liked it.